BTS World Tour: Love Yourself in Seoul hit cinemas on the 26th of January 2019 for a one day movie cinema experience and filled every session worldwide! Last year BTS was the main attraction on the 15th of November as ‘Burn The Stage: The Movie’ was released. It became the biggest-ever box office haul for an event cinema release. ‘Burn the Stage: The Movie‘ has raked in $18.5 million around the world. Due to popularity, it had encore screenings that helped surpass the ‘One Direction: Where We Are’ movie and boosted that extra 2 million admissions from the 14 million tie. Read more and watch the trailer here! 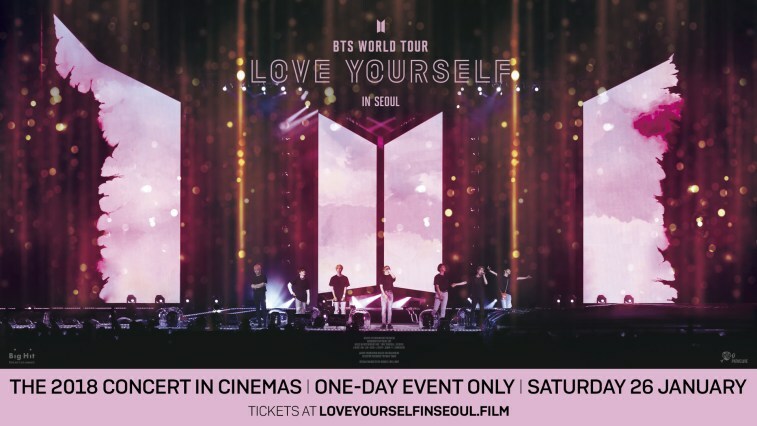 This year on the 26th of January BTS World Tour: Love Yourself in Seoul hit cinemas across the world for a one day showing of the concert film. Tickets went on sale on December 18th last year and ended up filling up nearly every session shown on the one day special event across the world, hitting 95 countries showing in up to 3,800 cinemas. 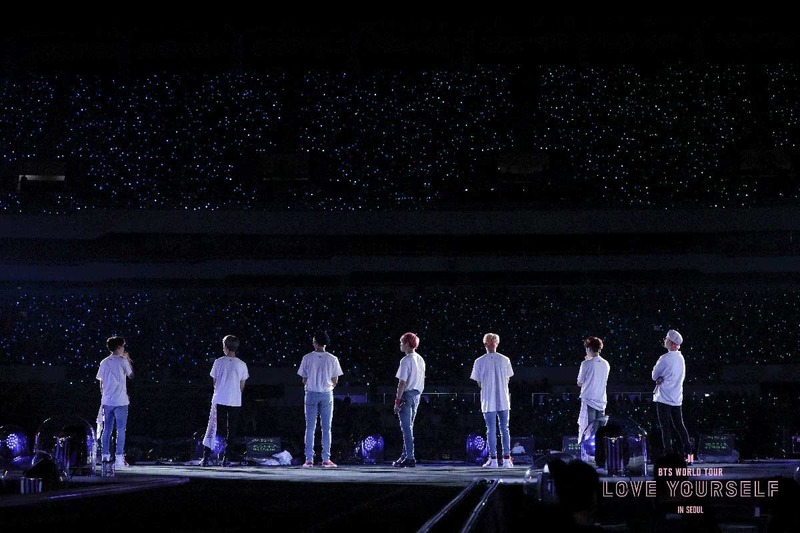 Twitter had #LoveYourselfinSeoulFilm trending and flooding timelines, but some people mentioned that there were major ups and downs about their experience in the movies as some treated it as a actual concert and it was hard to watch or hear the music or see the screen, but the movie itself was absolutely breath taking. Some agreed with the atmosphere being wild and some didn’t, but either way the up-close and personal view of the concert movie was leaving most speechless. The movie captured BTS with perfectly raw vocals, breath-taking performances and the members themselves looking absolutely ethereal. It was the closest thing to being at an actual concert and a great experience to have and also share with others having to see and hear some of your favourite performances and songs on the big screen. BTS fansites and Armys across the world took the extra step in going out their way to provide free merchandise for fellow movie watchers and Armys to take home and enjoy. Some even dressed up or brought their own merchandise to support the movie. How sweet! Did you get to see BTS World Tour: Love Yourself in Seoul in cinema? How was your experience? Would love to hear! Let us know in the comments below!